An epic battle between conformity and exceptionality...which will be catnip for superhero buffs and a great time at the movies for everyone else. 105 min. Walt Disney Pictures. Director: Brad Bird. Cast: Craig T. Nelson, Holly Hunter, Samuel L. Jackson, Jason Lee, Dominic Louis. "They keep coming up with new ways to celebrate mediocrity!" So bellows 1960s dad Bob Parr, who rightly considers himself a victim of an increasingly play-it-safe society, in Brad Bird's The Incredibles. Though one-time superhero Bob has the voice of Craig T. Nelson, the sentiment belongs to writer-director Bird, whose commitment to quality has graced TV's The Simpsons and his own film The Iron Giant. Bird stages an epic battle between conformity and exceptionality in The Incredibles, which will be catnip for superhero buffs and a great time at the movies for everyone else. Bob--a closet superhero since an onslaught of lawsuits sidelined his ilk--wins the bread for his nuclear family: Helen, formerly known as Elastigirl (and voiced by Holly Hunter); daughter Violet, hampered by self-esteem (and voiced by NPR princess Sarah Vowell); son Dash (voiced by Spencer Fox); and baby Jack Jack. In a prologue presumably set around 1950, Bird sets the film's energy, pace, and humor as Bob's "Mr. Incredible" fights crime in Municiberg and banters romantically with rubbery Elastigirl (she purrs, "I think you need to be more flexible"). Fifteen years later, the age of heroes has passed, leaving Bob--relocated to Metroville by the Superhero Protection Program--to toil in the merciless bureaucracy of an insurance company (amusingly personified by the ever-clenched Wallace Shawn). Bob and best pal Lucius (a.k.a. ice-powered hero Frozone) occasionally step out as vigilantes, so when Bob gets a formal invitation to suit up for a great adventure, he leaps at the chance. Impressing the management by vanquishing a rampaging robot spider at his mysterious new boss's James Bond-esque island compound, Mr. Incredible resumes his double life and attempts to keep Helen from finding rubble on his collar. Eventually, a crisis erupts which necessitates the call-up of Elastigirl and Frozone, as well as the initiation of Violet--who has the power of invisibility--and Dash, a pint-sized version of The Flash. 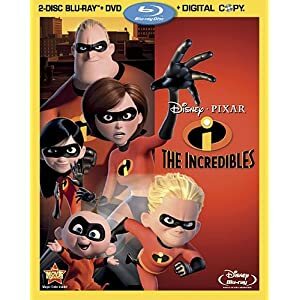 The Incredibles sports monumental design work with astonishing detail and rich use of color; as we've come to expect from Pixar Animation Studios, detours into fake grainy film stocks are as impeccably rendered as the pixel-perfect whirlwinds of action. The cartoony characters are a hoot and a holler, while the settings are alternately fantastic (the Bond-styled lairs and control rooms) and photo-realistic (a dense jungle with a waterfall and a volcano). The uniformly spot-on voice work also includes the talents of Samuel L. Jackson (as Frozone), Jason Lee as bad-guy Syndrome, and Bird himself as Edna Mode, the diminuitive Edith Head of the superhero set. Bird teeter-totters between comedy and adventure: there's plenty of both, though neither approach feels entirely realized on its own merits. Though fast-paced (and dynamically scored by Michael Giacchino), The Incredibles becomes thematically redundant in the multiple climaxes of the family-bonding home stretch (thoroughly trodden in recent years by the Spy Kids series). The misguided Syndrome espouses a hero-envy philosophy that "Everyone can be super!" and daughter Violet, face frequently masked by hair, laments, "No one in this family is normal." When Helen gets politically correct by telling Dash, "Everyone's special," he answers, "Which is another way of saying no one is." Bird can't reconcile the underlying message that standing out from the crowd is a good thing with the need for secret identities. Nevertheless, the well-intended message, along with the film's funny approach to realistic family problems and sibling rivalry, will appeal to an audience outside of comic-book buffs, who will geek out over the old chestnuts about why superheroes shouldn't wear capes and how bad guys thwart themselves by "monologuing." In animation terms, The Incredibles is state-of-the-art, and in narrative terms, it's a heck of a lot of fun. Disney and Pixar deliver another fantastic special edition with their 2-Disc Blu-Ray + DVD + Digital Copy special edition of The Incredibles. A/V credentials are typically awe-inspiring, with a near-perfect hi-def image and a blisteringly effective, state-of-the-art DTS-HD Master Audio 5.1 ES surround mix. Like many CGI-animated films, this one comes to video with some negligible banding, but other than that, it's tack-sharp, brilliantly colorful and perfectly calibrated in contrast. The highly dynamic wraparound sound is show-off-your-system stuff, with well-placed and detailed effects work and pulse-pounding delivery of Michael Giacchino's score. Special features are bountiful, beginning with interesting and informative Director’s Commentary by producer John Walker and director Brad Bird. Also here for those looking for greater insight into the workings and personalities of Pixar is an Animator’s Commentary by supervising animators Tony Fucile, Steven Hunter, Alan Barillaro and animators Gini Santos, David DeVan, Kureha Yokoo, Dave Mullins John Kahrs, Robert Russ, Angus MacLane, Travis Hathaway, Doug Frankel and Peter Sohm. The short that played theatrically with The Incredibles, "Boundin’" (4:40, HD), returns here with optional commentary by director Bud Luckey. "Jack Jack Attack" (4:42, HD) is a second animated short that fills out the story of The Incredibles. "'Jack Jack Attack' Explored" (4:43, HD) offers video-enhanced commentary by director Brad Bird, story supervisor Mark Andrews and character designer Teddy Newton and animator Bret Parker. "The Incredibles Reunited" (22:06, HD) gathers director Brad Bird, producer John Walker, supervising technical director Rick Sage, character designer Teddy Newton, supervising animator Tony Fucile, production designer Lou Romano, story supervisor Mark Andrews for a fresh retrospective roundtable. Disc Two kicks off with "Paths to Pixar" (5:53, HD) focusing on storyboard artists. "Studio Stories: Gary’s Birthday" (1:25, HD) continues the series of amusing Pixar anecdotes. "Ending with a Bang: Making the End Credits" (1:35, HD) is a self-explanatory behind-the-scenes bite. The New Nomanison: A Top Secret Redevelopment Plan (HD) is an interactive map of the New Nomanison island, with "Introduction" (3:30, HD). Seven "Deleted Scenes"amounting to approximately thrity-three minutes include "Intro" (1:54, HD), "Alternative Opening (15:02, HD), "Snug" (6:31, HD), "Vipers" (4:08, HD), "Bob in Traffic" (2:19, HD), "Helen Confronts Bob" (3:10, HD), "Helen's Nightmare" (1:33, HD). Further Classic DVD Content includes featurettes on "Story" (7:15, SD), "Character Design" (5:30, SD), "E-Volution" (2:45, SD), "Building Humans" (6:17, SD), "Building Extras" (2:00, SD), "Set Design," "Sound," "Music," "Lighting," "Tools," "Mr. Incredible and Pals" animated short, "Mr. Incredible and Pals" commentary with Mr. Incredible and Frozone, "NSA Audio Files and Stills," "Vowellett - An Essay by Sarah Vowell" and "Who is Bud Luckey?" Easter Eggs include the segments "Incredibles Socks" (3:33), "Dancing Bob" (:30), "Cake" (:30), "Buttons and Doors" (2:30), "H3A Classroom," "Angus’ Guards," "Incrediblunders," "Frank & Ollie," "Ball & Scooter" and "Markisms." Lastly, Publicity includes "Character Interviews" (6:30, SD) and "Trailers" (SD) including the theatrical trailers and TV spots. All site content © 2000-2019 Peter Canavese. Page generated at 04/24/2019 04:20:00PM.